I’m an herbal book junkie. Maybe you are too. I love to buy the latest herbals published by my fellow practicing herbalists. I equally love discovering old books that are real gems. As part of my ongoing series on herbal medicine and the various organ systems of the body I’ve recently taught a series of three classes on herbs for women’s health. I’ve revisited material that I compiled years ago and in the process have gotten reacquainted with my the section of my library dedicated to women’s health. While there are many books on the topic of herbs and natural healing for women’s health, I wanted to share you with you some of the stand-outs, books that really shine for whatever reason. Perhaps they are exceptionally illustrated, richly detailed, full of the most current research or lovingly share traditional folk wisdom and accessible home remedies. Whatever each author below has tried to do, she’s done it well. Happy reading! Herbal Healing for Women: Simple Home Remedies for Women of all Ages by Rosemary Gladstar. Who doesn’t love Rosemary Gladstar? Her books have been the entree into Western Herbalism for a generation or two of Americans interested in herbal medicine. 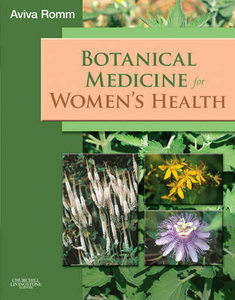 Herbal Healing for Women is a great book. Like most herbals written about women’s health it’s divided into sections that move chronologically through the lifecycle including puberty and adolescence, menstrual problems, fertility, pregnancy, postpartum and menopause. Her love for plants shines through in the text. Rather than viewing herbs as medicines one buys and ingests, Rosemary’s books encourage the integration of herbs into everyday life as foods, medicine, spiritual aids and part of the beauty regimen. There’s a strong DIY thrust to this book, with solid comprehensive information on making medicinal teas, oils, salves, ointments, pills, capsules, syrups, tinctures and liniments. This is the perfect reference for the beginning medicine maker. Some of my favorite recipes either come from this book or are inspired by it including vaginal suppositories for infections, a great syrup for anemia, lozenges for heartburn in pregnancy. Suggestions for various problems are not all herbal. Some suggestions are dietary, lifestyle and simple home remedies utilizing common natural items like oats, garlic, honey and yogurt. This book has especially detailed sections on infections like yeast, trichomonas, bacterial vaginosis, urinary tract infections, herpes etc. I don’t use the formulae for teas, but that is true for about every herbal I encounter. That’s not really my herbal style. I tend toward a more constitutional and energetic style of Traditional Western Herbalism and rely heavily on local herbs over herbs of commerce and tongue and pulse assessment in my consultations. 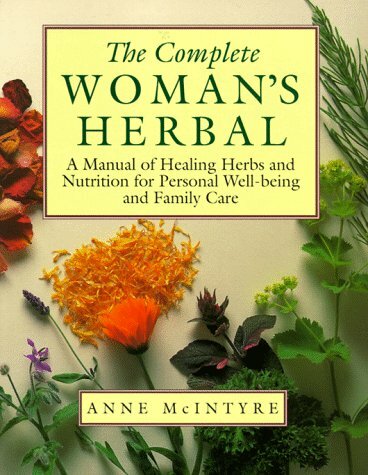 The Complete Woman’s Herbal by Anne McIntyre. Anne McIntyre, a British medical herbalist is a favorite of mine. Her complete woman’s herbal includes an introduction to herbalism and sections on puberty, menstruation, fertility, pregnancy, postpartum, infant care, breastfeeding, menoapause and the elder years, as well as shorter sections at the end on first aid, herb for beauty and household herbs. Suggestions are herbal dietary as well as flower essences and essential oils. What makes this book stand out are the plant profiles. Several of Anne McIntyre’s many books include stellar one page plant profiles each illustrated with a color photo or a quality line drawing. I just love these profiles; rather than simply a list of uses, McIntyre helps the reader make sense of the plant’s energetics and chemistry and promotes a more complete understanding of why one would turn to a certain plant for disparate symptoms and conditions. ( I also highly recommend McIntyre’s Folk Remedies for Common Ailments, Flower Power, The Herbal for Mother and Child and Herbal Treatment of Chldren: Western and Ayurvedic Perspectives). 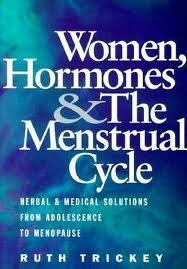 Women, Hormones and the Menstrual Cycle: Herbal and Medical Solutions from Adolescence to Menopause by Ruth Trickey. When I discovered this book by Australian midwife, naturopath and TCM practitioner, Ruth Trickey, I felt like I hit the jackpot. This is the perfect book for diving deeper into women’s health for those who are already relatively knowledgeable about herbal medicine, female anatomy and physiology and the common reproductive and sexual health problems encountered by women. In this book Ruth Trickey takes you further into the minutiae of the female endocrine system. She discusses a wide variety of problems including polycystic ovarian syndrome, endometriosis, fibroids, cysts, acne, PMS, menopausal symptoms. She discusses in great detail the currently understood mechanisms of these disorders, presents the orthodox medical treatments in detail and outlines herbal and dietary protocols for healing and symptom alleviation. There’s a fantastic Materia Medical in the back section of the books where herbs are organized by their women’s health actions like uterine tonics, spasmolytics and herbs that influence the hypothalmic pituitary unit, among other actions. Each entry includes traditional uses, information about the phytochemistry and relevant scientific research that has been done. She brings her TCM knowledge into the accounts as well in a way that enriches the text even for those who don’t have professional level TCM knowledge. I have a copy of the the first edition, published in 1998 (pictured above). There have been two subsequent editions. The latest published in 2012 is a pricey $199 on amazon and is marketed as a textbook. The Natural Pregnancy Book: Herbs , Nutrition and other Holistic Choices by Aviva Jill Romm. This is really the only herbal you need on the topic of herbs for pregnancy. It’s much more than an herbal really. It’s a comprehensive healthy pregnancy guide. The Natural Pregnancy Book contains a truly excellent ailments section, organized alphabetically, which includes all the usual discomforts like heartburn and hemorrhoids and morning sickness, but is much more comprehensive than other pregnancy herbals. It includes much more like Group B strep, ketones or sugar in the urine, breech birth, herpes, hyperemesis….The rest of the book is excellent as well, including sections on emotional and physical changes through the trimesters, a great diet/nutrition section which includes analysis of client’s diet diaries from the author’s practice. It’s also the only book I’ve seen that devotes a whole chapter to the last month of pregnancy. The last month of pregnancy is not simply the end of the third trimester. It really is a special and unusual time, hormones are flowing, a woman may be increasingly uncomfortable, she is preparing for birth and breastfeeding, she may be dealing with many signs and symptoms of warm up labor. I love that Aviva Jill Romm devotes a whole chapter to this special month and I like it when my pregnant clients read this as they prepare for the end of their pregnancies. I also recommend Romm’s Naturally Healthy Babies and Children, Natural Health After Birth and Botanical Medicine for Women’s Health. This is the latest addition to my women’s health library. I ogled this one for awhile on amazon. At $60 it’s an investment book, and I wondered if there would be anything new in it for me. I finally bought it and it exceeded my expectations. 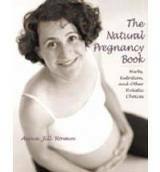 Many sections of this text are written by midwife-herbalist-medical doctor, Aviva Jill Romm, but the list of other contributors is impressive. It’s a who’s who in herbal medicine: Margi Flint, Roy Upton, David Hoffman, Christopher Hobbs, Ruth Trickey, Jill Stansbury, Amanda McQuade Crawford, David Winston, Susun Weed and more. It’s a big book and nearly 700 pages. I haven’t read it all yet, but have tackled the sections on hypothyroidism (yay! someone finally put a section on hypothyroidism into a herbal book about women’s health!) and the sections on fibroids, PCOS amenorrhea and endometriosis. I’m impressed so far. Like Women, Hormones and the Menstrual Cycle, current information about a disorder is presented, followed by a discussion of orthodox treatment and botanical treatments. Case studies are included in the text, which I really appreciate. Current research is included. The author and contributors don’t shy away from the tough questions and dive into some of the most exciting controversies in herbal medicine, discussing efficacy and safety among other issues. Historical information is also thoughtfully included and I feel that it enriches the discussion. This is dense, detailed information. If you are new to women’s health or to herbal medicine start with one of the general herbals listed above. If you are looking to go a little further with your reading, it’s worth it. 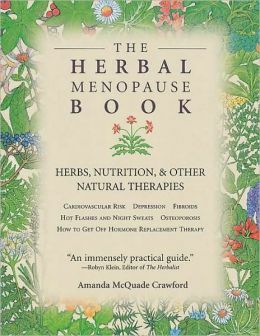 Both Herbal Healing for Women by Rosemary Gladstar and The Complete Woman’s Herbal by Anne McIntyre have a section on menopause. 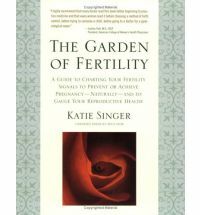 However, many herbal enthusiasts and practitioners may want a book devoted to this important phase of the female lifecycle. Amanda McQuade Crawford’s book fills that niche fairly nicely. She discusses female aging during the years leading up to menopause through the years beyond and includes sections on not only flooding, erratic cycles, mood, hot flashes, vaginal thinning and dryness but also heart discease, arthritis and changes in the immune system. There’s a very good discussion of hormone replacement therapy. Formulae have evocative poetic names like “Smooth Sailing,” “In Mint Condition,” and “Many Splendored Thing.” As I mentioned above, I don’t use these types of formulae and prefer to give each client a blend customized for her. I find the general information about the various conditions and the herbal profiles in these types of books to be the most helpful and relevant parts. Not herbals, but if you are interested in women’s health you should read them. Either of these books (or both) are great additions to the library of those interested in or working with women’s health issues. Both are practical guides to learning the Fertility Awareness Method (FAM) to either achieve or prevent pregnancy. FAM is a method of observing and charting signs of fertility including basal body temperature, cervical mucus and cervical position/quality. Both of these books offer much more than learning the method. What you learned about the female cycle in health class in high school was a gross oversimplification. These books will help you understand the beautiful, cyclical nature of the female body. You’ll also learn what’s going on hormonally during youth, the fertile years, pregnancy and perimenopause. The books also cover the how and why this system can be disrupted including conditions of hypothyroidism , PCOS, and other factors like diet, weight and smoking. I learned so much reading these books. Even if you don’t feel like taking the plunge into the world of natural birth control, a study of this topic will deepen your understanding of your own body and what you are going through each and every month. Feel free to share your favorite herbals for women’s health in the comments section. I would also add that as a Traditional Western Herbalist I love the old stuff. There’s some real pearls in the works by the eclectic doctors. My faves are Ellingwood and King’s Dispensatory, both of which are found online at http://www.henriettesherbal.com I also always refer to Matthew Wood’s fine two volume The Earthwise Herbal. Even though they are not specific to women’s health they include excellent specific indications for many, many herbs as they relate to women’s health.